"In Memory Of ~ Our Dead Soldiers ~ (GAR badge)". 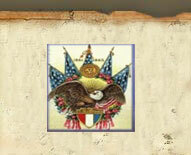 "Americus Post ~ No 249 ~ G.A.R.". "In Memory Of Our ~Sisters Who Are Gone ~ (WRC badge)". "To Our ~ Silent ~ Victors". "Erected By ~ W.R.C. No. 70 ~ And Citizens ~ Of Emporia ~ 1913". "Lest ~ We ~ Forget". 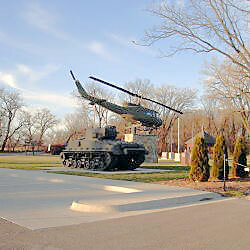 Description: This plaza includes a flagpole, a central plaza with urns representing the major armies, and 2 cannons. The inscription on the flagpole stand reads: "Memorial ~ In Memory Of The Brave Boys In Blue ~ We Rally Round The Flag ~ Ladies Of The G.A.R. 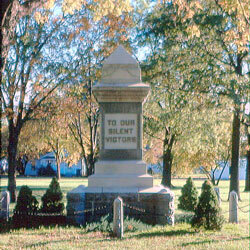 ~ Erected By Garfield Circle No. 22 ~ Ladies Of The G.A.R. 1915 ~ Ozetta Marshall Taylor President". Both cannons are 12-Pdr Mountain Howitzers. Both howitzers are smoothbore and made of bronze. 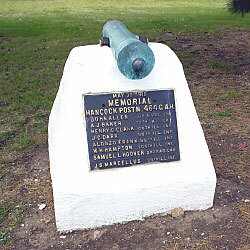 The inscription on one of the cannon mounts reads: "May 30, 1918 ~ Memorial ~ Hancock Post 464 G.A.R." 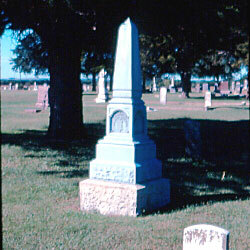 This Cemetery also has a GAR burial plot to the NW of the monument. 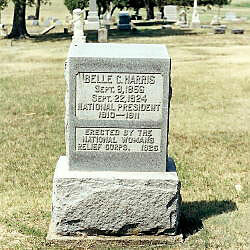 Description: This granite monument commemorates Belle Harris, National President WRC. The inscription reads: "Belle C. Harris ~ Sept 6, 1856 ~ Sept. 22, 1924 ~ National President ~ 1910-1911 ~ Erected By The ~ National Woman's ~ Relief Corps. 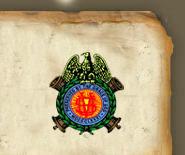 1926". Description: This large memorial park has a mounted helicopter and tank along with a variety of monuments, flagpoles, and plaques. The plaque at the entry reads: "In Honor of ~ Those Who Have Served ~ in the Armed Forces of ~ the United States ~ of America". 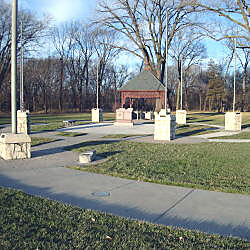 The central flagpole is labeled: "Flag Pole Donated by ~ Veterans of Foreign Wars Post 7957 ~ In Honor of Those Who Served and Survived ~ and Those Who Served and Died" Other flagpoles are labeled: "Civil War", "Spanish American War", "World War I", "World War II, " "Korea", "Viet Nam", "Persian Gulf War", "Operation Enduring Freedom", "Operation Iraqi Freedom". A large granite marker is inscribed: "Dedicated To All Men And Women ~ Wounded In All Our Wars ~ My Stone Is Red For ~ The Blood They Shed. ~ The Medal I Bear ~ Is My Country's Way ~ To Show They Care ~ If I Could Be Seen ~ By All Mankind ~ Maybe Peace Will ~ Come In My Lifetime ~ Erected By Dept Of Kansas Military Order Of The Purple Heart". There is a small marker with space for a floral urn labeled: "Unknown ~ Lest We Forget". Other markers commemorate specific individuals, the ship's bell from the Frigate Emporia, and the U.S.S. Timmerman. 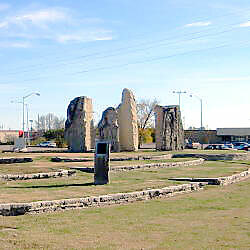 Description: This grouping of stone pylons was erected in 1994. 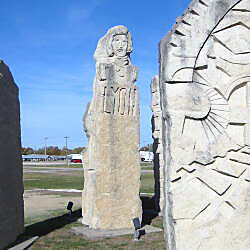 These were a project of Richard Stauffer, Emporia Arts Council and the 1992 Kansas Sculptors Association. Pylons are erected for Alahe (an Osage Indian name meaning "people of the wind"), Preston B. Plumb, the founder of Emporia and an early legislator, Nathaniel Lyon, and William Allen White. The Lyon stone is described as: "Lyon County, in which Emporia is located, takes its name from Nathaniel Lyon, a Civil War general. The Lyon stone is echoed by a pylon that symbolizes elements of the land and air: clouds, lightning, rainbow, rain, creeks, hills, turkey and fish". 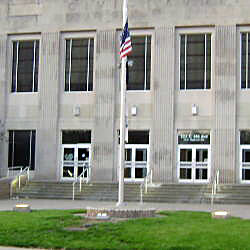 Description: In front of the Auditorium is a flagpole with a broad round base. 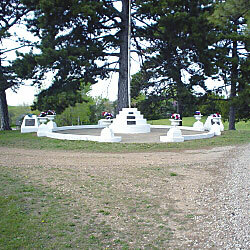 Embedded in the top of this base is a plaque indicating the flagpole was a project of the 1976 U.S. Bicentennial. Also embedded in the flagpole are bronze plaques with the logos of the G.A.R., the United Spanish War Veterans, the VFW, and the American Legion. 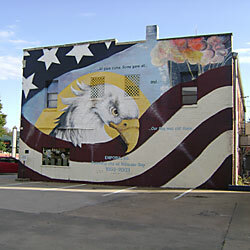 Description: The mural includes the words: ". . . All gave some, Some gave all . . . ~ and . . . Our flag was still there . . . ~ Emporia, KS. 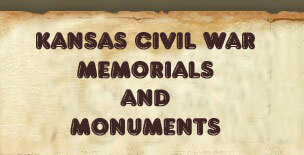 ~ Founding city of Veterans Day ~ 1953 - 2003". A bronze plaque at the lower right reads: "Our Flag Was Still There . . ." ~ Presented by the ~ Leadership Emporia Class of 2003 ~ Thank you to all who contributed their ~ time, talent and resources. ~ Dedicated November 6, 2003".